Release 2.0.590 is now available and fully loaded with fresh enhancements and new functionality. We’ll cover a few of the bigger items here, with the full list on the What’s New page. 500 record limit be gone! 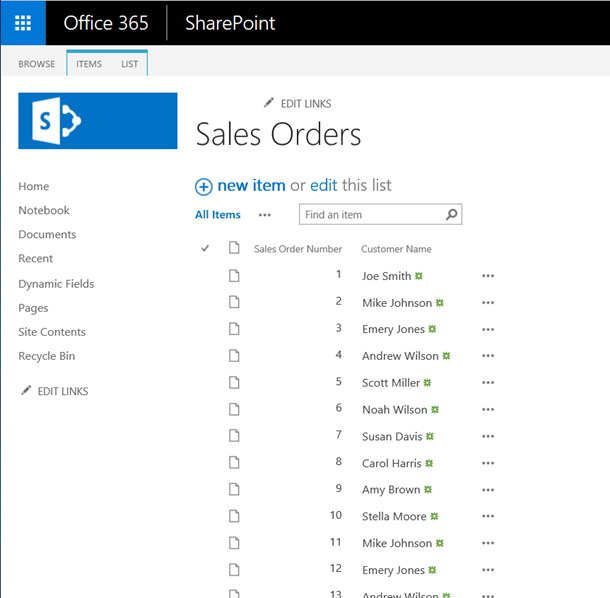 In January, we announced that the SharePoint connector now supports delegation and more than 256 records. 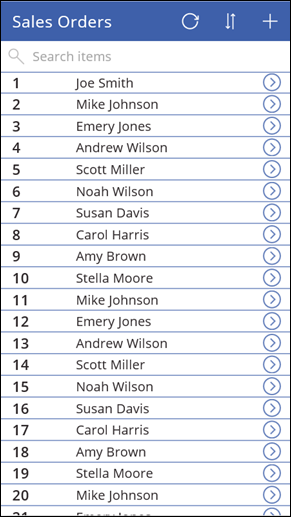 In this release of PowerApps, we take advantage of this functionality to support large lists when creating apps from data. And we can scroll all the way to the bottom of the list. You can’t experience it by reading this blog post, but these results are available quickly. 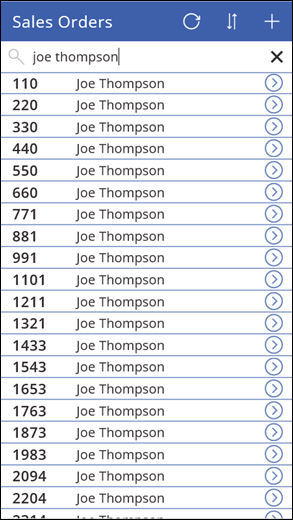 We do not need to wait for all 5,000 records to be retrieved by PowerApps, instead we are only downloading the records that match our criteria. To accomplish this, we have introduced the StartsWith function. StartsWith tests if one text strings begins with another. 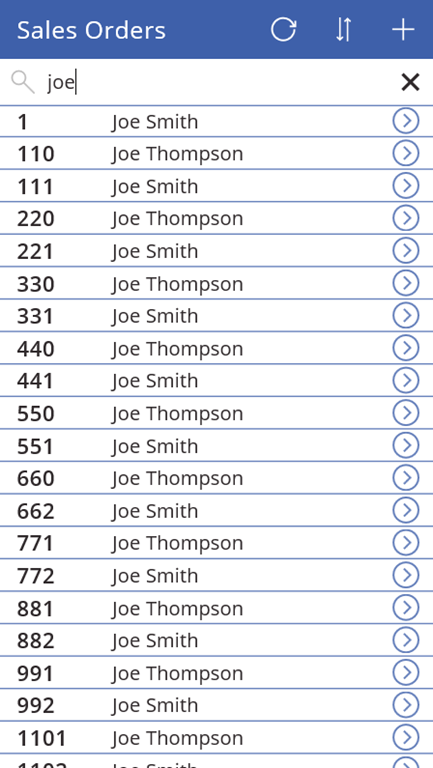 For example, StartsWith( “Joe Smith”, “joe” ) returns true because “Joe Smith” begins with “Joe”. StartsWith( “Joe Smith”, “amy” ) and StartsWith( “Joe Smith”, “smith” ) both return false because “Joe Smith” neither starts with “amy” nor “smith”. When we created our app, the Items property of the Gallery control was set to the following which uses StartsWith to filter the Sales Orders data source. 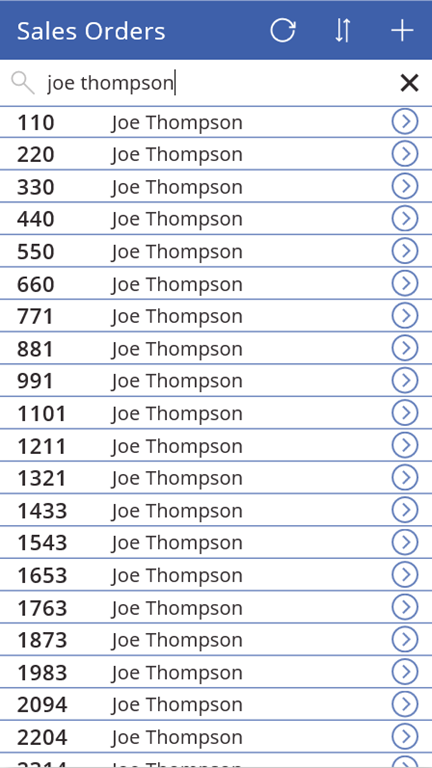 Again one small modification, we changed the sort column to use the “Sales Order Number” column instead of “Title”. StartsWith is a delegable function that the SharePoint connector supports. StartsWith is similar to the In operator and Search function, but whereas they test if one text string occurs anywhere in another text string, StartsWith only looks at the beginning. At this time, the SharePoint connector cannot delegate In and Search which is why must use StartsWith. 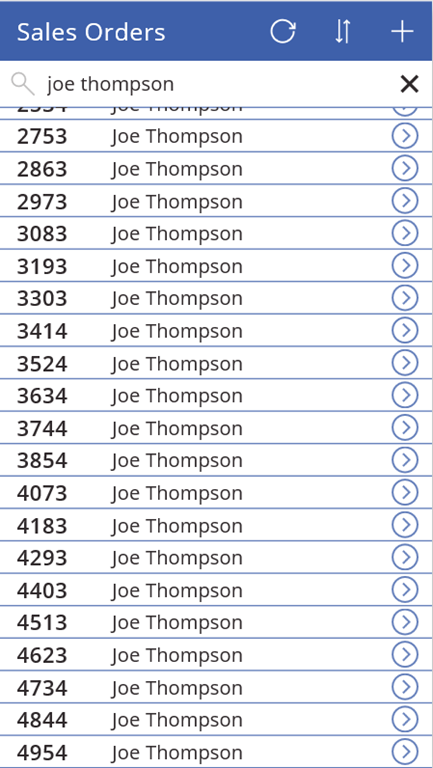 For an exact match, the SharePoint connector does also support delegation of the = (equals) operator but that is less useful for a search scenario (in our example, typing “joe” would have returned no results). As we just saw, StartsWith can be delegated to SharePoint. But how about SQL Server? How is one to know what is delegable where? We know that working with delegation can be challenging. If you have not already, we highly recommend reading the delegation overview. In short, delegation refers to performing filter and sort operations at the data source. 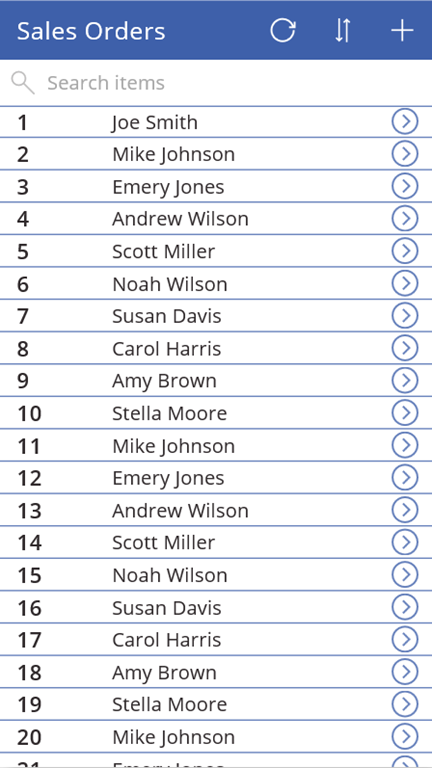 Without delegation, all the records of a table must be loaded by PowerApps to operate on locally, which can be very time consuming and soaks up network bandwidth. 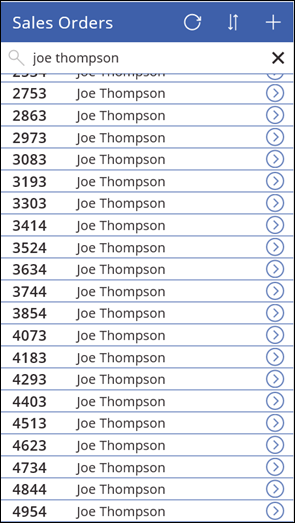 To avoid long delays, PowerApps caps the amount of data that it will process without delegation. As a result, when possible you should stick to delegable operations to ensure your app scales as your data grows. While authoring, PowerApps will flag non-delegable operations with a blue warning dot. We are committed to enabling more delegation on more data sources. Ideally, it should be rare that you see a blue dot and need to think about this as the most common operations would be delegable for the most common data sources. It will take us some time to get there but we won’t stop until we do. Since the beginning, the Gallery control has been a handy tool for displaying multiple items in a customizable template. The template for the individual item could be styled to suit the needs of what was shown to include images, text, buttons, etc. But it always had to have fixed boundaries and sizes for the template and its items. It works much like other Gallery controls with the caveat that each item inside the gallery will be resized dynamically to fit its controls, some of which can have variable heights (i.e. AutoHeight set to true). This means that you can dynamically position and style elements inside without worrying about their overflow! 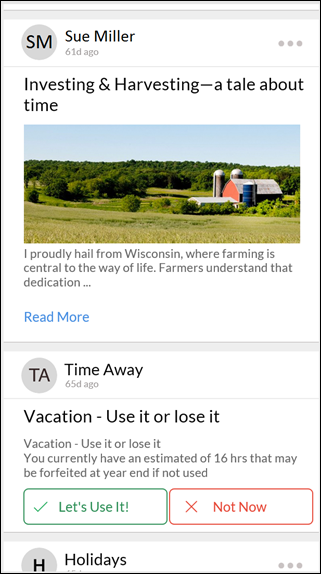 In the app shown above, we have a few controls inside our gallery template. The header and the title at the top have fixed heights, but the HTML text control in the middle has its AutoHeight property set to true. 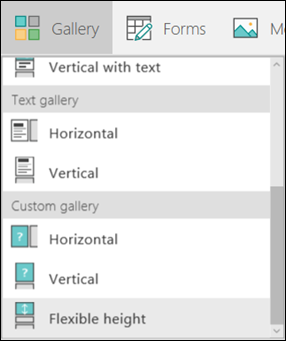 HINT: If you have trouble adding items to the Gallery template, increase its height. It only affects the design experience to allow you to add more controls; at runtime the height will be set dynamically based on the content. Since the height of the HTML text control will vary depending on the content inside, it will impact the layout of all the controls below it. Likewise, if we had any additional items below, we would have the freedom to calculate their Y and height dynamically, without worrying how this fits inside the Gallery template. 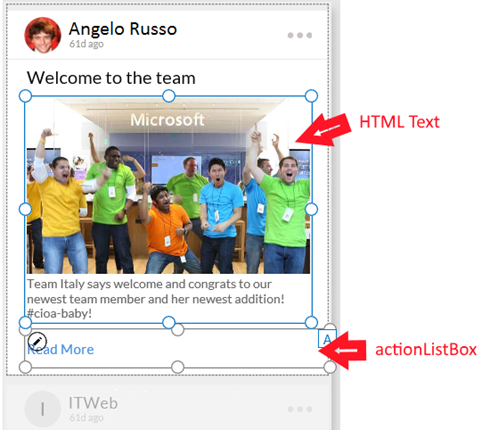 This concept, along with the new gallery control opens the door to beautiful and dynamic feeds in your apps. Clean, consistent data helps everything run more smoothly. And the best way to catch and correct inconsistencies is to validate data as it is being entered. We have provided a set of predefined patterns (Letter, Digit, Hyphen, etc) to make writing common patterns easy. They can be easily chained together with the & operator. Regular expressions are very powerful, available in many programming languages, and used for a wide variety of purposes. Although cryptic, those that are familiar with regular expressions can read the above syntax. For those who are new to them, it takes some time to get to used to them. Fortunately, there is a wealth of information, tutorials, and examples on how to use them on the web. Customize the order in which controls are activated when users press the Tab key. Customize the thickness of a slider rail. On Android devices, refresh the list of apps by tapping a button instead of swiping down. As always, this release contains many bug fixes and performance improvements.